It should come as absolutely no surprise to anyone here that I am extremely picky about audiobook narrators. I can’t even remember which book it was now, but a couple weeks ago, I turned one on, and within five minutes, I punched the eject button. The woman was an overachiever when it came to character intonations: her “kid” voice was so grating, I couldn’t stand it a second longer. Charles Keating, on the other hand, is superb. Let me just get that out of the way; he is perfection. I’m already on another audiobook narrated by him, and it is fabulous as well. 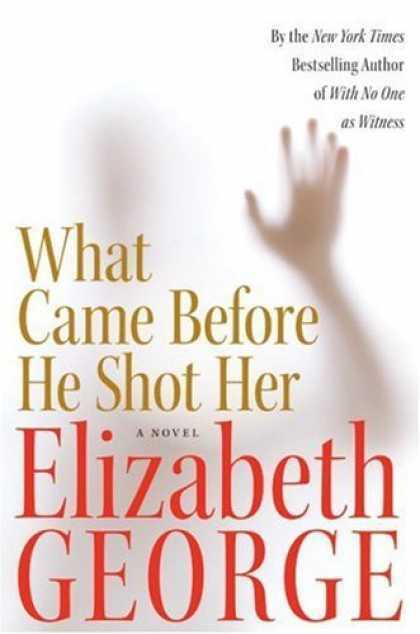 What Came Before He Shot Her is written by Elizabeth George. Mystery readers may recognize her name, but do not be fooled: This novel is no mystery. Mysteries do not divulge what happens in the title. Mysteries do not (typically) focus on the perpetrator of the crime. Instead, this book is a sociological, psychological exploration of a cast of characters I won’t soon forget. The book opens with three children of mixed race – Ness, Joel, and Toby – being shuffled off to the stoop of their Auntie Kendra’s house in South Kensington, London. Their Gran is going back to Jamaica with her boyfriend, George, and the children are not part of the picture. Ness is a teenager, angry and bitter; Joel is kind and compassionate and ever-watchful of his brother; Toby has developmental problems and is totally devoted to his older brother. The three have been shuffled around since the murder of their father, who was shot in the street, and the institutionalization of their mother. Kendra comes home to find the boys waiting for her; Ness has already run off looking for drugs. What follows is a tale so wrenching, I felt my chest tighten at several points throughout the book. While Kendra deals with this sudden alteration to her life, Ness finds a dealer, Blade, and offers herself to him in exchange for a steady supply of drugs. Naive and foolish, Ness doesn’t understand the full extent of Blade’s enterprise or power. When she finds out Blade has other girlfriends, there is an ugly brawl – and Blade is shown up by Kendra’s boyfriend Dix. Joel is on the straight and narrow. He knows how best to mollify Toby and watches out for him constantly. A gang of boys, on the lookout for the newbie – the one with the weird brother – quickly target Joel and Toby. Neal Wyatt and his gang are out to get them, and no amount of “sorting” will deter Neal’s determination to get to Toby and through Toby, Joel. As the pranks become more and more deadly, Joel knows what he has to do in order to save his small, patched-together family. Watching, or rather, listening to this story filled me with dread. I knew exactly what would happen. I knew Blade would not live and let live after being shown up. I knew Joel would go to him for help, and I knew Joel was innocent enough to believe the Blade would help. The buildup was excruciating, but the interplay between the characters hooked me. It is horrific on many levels, no less so because of the outside forces trying to do good but failing miserably. These children don’t live in the type of world where poetry and art can lift them above violence. Adults don’t always equal safety, and sometimes your worst enemy is the only symbol of safety. This entry was posted in audiobooks, fiction, fun read, library, mystery, violence and tagged Charles Keating, Elizabeth George, gangs, London, violence on August 6, 2010 by pickygirl.